Are you battling between getting your kid out of bed every morning and taking them to school on time? Sure, it can be challenging, especially if your little one went to bed last night so tired after a PlayStation video game or just after a tiring day. Sometimes they won’t hear your 7 A.M wakeup call. And if they are heavy sleepers, they will likely take forever to drag themselves out of bed to prepare for school or early breakfast on the weekends. Yet, you can make your child’s rise and shine routine stress-free, and fun, with the best alarm clocks for kids. Some clocks will light up when it is time to wake up. Some will play special lyrics and melodies that your little one loves to listen. And some will scoot around the room to get your child out of bed on time ready for a new day. Noise that digital kids alarm clocks make will let them know it is time to wake up. So you never have to worry about them being late for school, missing timely breakfast, getting ready for a trip, or completing their weekend homework on time. Not every child fancies movie characters or cartoons. So, if you are looking for alarm clocks for kids with no such designs as cartoons or scary characters shown in movies, opt for a Plumeet Large Digital LCD Bedside Alarm Clock. 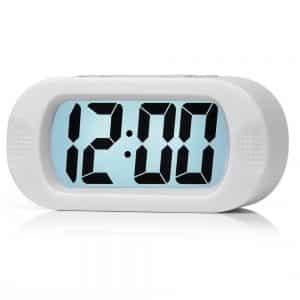 This clock is ideal for kids, teenagers, for office use, kitchen, or desk because of its large LCD display. It is lightweight and small sized, making it portable and easy to carry while traveling. Even with a large screen, its light is soft. So, it won't disturb or distract your kids at night while sleeping. Even with utmost care, accidental falls are bound to happen. That is why the casing of this clock comes in high-grade silicone to create the non-slip characteristic in the case of such falls. Similar to the best alarm clock for heavy sleepers, Plumeet Bedside Alarm Clock increases its volume when it goes off, unless you snooze. The alarm goes off immediately the 8-minute snooze period elapses. 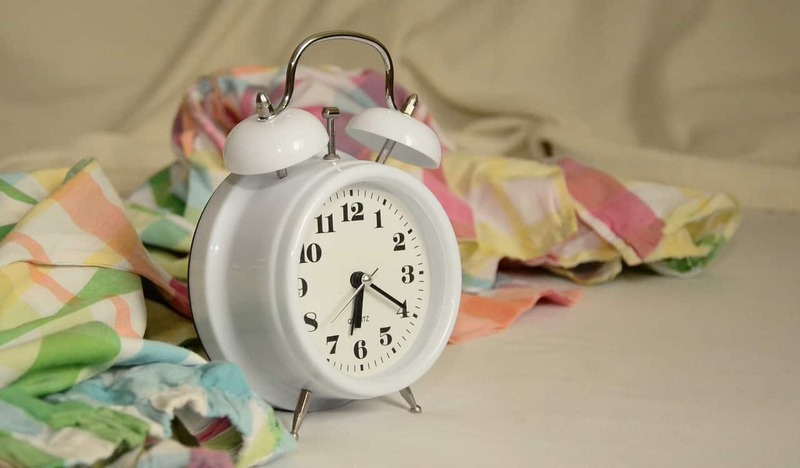 The ease to operate the clock is what makes it one of the most valuable alarm clocks for kids. KEYNICE light up alarm clock suits parents who love multi-functional alarm clocks. This alarm clock comes with a changeable light and a built-in Bluetooth speaker. The lamp comes with several LED lights in different colors to choose by just a simple touch at the KEYNICE top. Kids love different colors. Allow them to choose their favorite by cycling through the six colors in the series and land their choice. After selecting the favorite color, you can tune to a favorite music that your kid can enjoy. The KEYNICE Alarm Clock for Kids can play music from a Memory card as well as the TF card. If you can't find a Memory or TF Card to fill up with your little one’s favorite music, use any Bluetooth device to play the tunes stored in the KEYNICE Alarm Clock. The clock also supports wireless connection. The digital timekeeping, functional mood lights, and wireless connectivity are what make this the best alarm clock for kids. 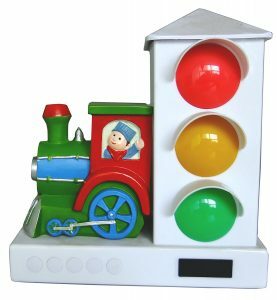 Most people call Stoplight Sleep a unique and adorable alarm clock for toddlers. And there is a good reason why it deserves the praise. Somehow, lights play a vital role in kid's learning because of the role visual inputs plays in their cognitive development. That explains why this clock has developed its design around the traffic lights that kids come across on a daily basis. The clock is programmed in a similar way the traffic lights function. Your child is programmed to know that once the right led comes on, it's time for bed and all other activities have to stop. During the night, it glows softly and gently still in the red color. The color turns to green once it reaches time to wake up. It is accompanied by a beeping alarm to confirm it is time to wake up to another bright day. If your kids slept well under the night sky during a camping event, introduce the same environment in their bedroom using this Galaxy Clock. This multi-functional clock includes a music player, a sky projector, and a night light. The night sky is projected to the ceiling of your kid's bedroom as soothing music plays in low volume. You can incorporate nature sounds to portray a typical night at the camping to sooth your child to sleep fast. You can choose to include other favorite tunes if you have them stored on your Smartphones or any other Bluetooth enabled devices. 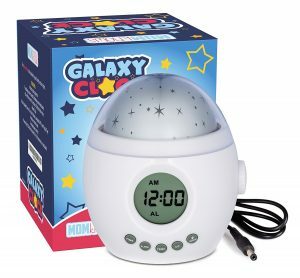 That’s possible because Galaxy Alarm Clock for kids supports wireless Bluetooth connectivity. Galaxy Clock also comes with a unique mood feature that's hard not to love. Ideally, Galaxy Clock has several moods to select from, so you do not necessarily have to stick to the artificial star projection. In addition to the set mood for the night and soothing music, the temperature in the room is monitored automatically for a peaceful night for your kid until morning. At any given time, everyone goes for classic items. So, looking for the signature bell to wake your kids the following morning might be a great idea. Consider going for the Peakeep 4-Inch Bell Alarm Clock. It comes with the iconic clock face, two legs stand, and a hammer striking two bells mechanism when it goes off. The interesting part of this clock is that it is fully analog. If your kids find it hard waking up from a deep sleep and can't hear the digital alarm, then this best alarm clock for heavy sleepers is the best for them. The heavy ringing is hard to ignore, and it does not have a snooze function. Your kids learn to wake up on time to go stop it from ringing. She or he is trained to wake up once since it cannot ring for the second time and instills discipline in them. In fact, the sweeping motion in this clock eliminates the typical tick-tock sound we are used to. 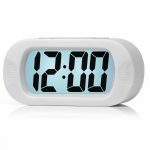 Equity La Crosse 70905 Cube LCD Alarm Clock makes an excellent item to add to your kid's bedroom, especially if the cube design is the main theme of their room. This clock comes in a various assorted hip and trendy colors to choose. The cube's color matches with its LCD backlight that makes the clock appealing. It is plain and does not come in fancy styles or features, though. 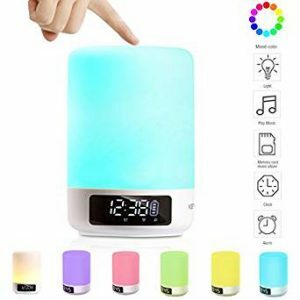 And what makes it one of the excellent alarm clocks for kids is that it is straightforward and easy to set time in both the 12 and 24-hour clock system. Its digital alarm is a bit loud and has the snooze effect. In addition to the time display, the date is also present at all times. 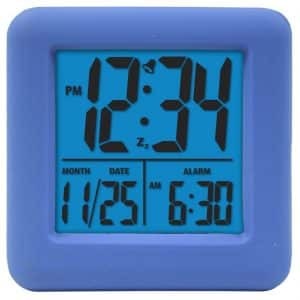 For those who like cube designs or themes, buying the La Crosse 70905 Cube LCD Alarm Clock is a great option. That’s because it serves an aesthetic purpose as well as wake the kids up on time the following day. For those who have watched and loved the Star Wars, this is one of the alarm clocks for kids that money can buy. And if you are looking for one to buy for a heavy sleeping kid, then this is the alarm clock for you. This clock comes in various characters that featured on Star Wars like BB8, Darth Vader, Storm Trooper, Chewbacca, and Yoda. With such items in the kid's bedroom, waking time will be a fun filled activity rather than seem like a punishment. 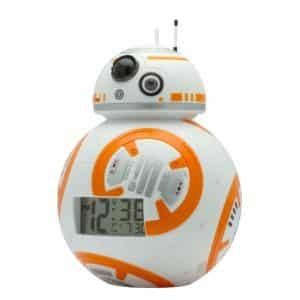 The BulbBotz Star War Alarm Clock is a perfect gift for kids that love and own miniature toy figurine and it will complement well, being part of their decor. Despite all these attractive features, it comes with all other time functionalities as other alarm clocks. Although the designs vary, they all have a snooze feature in addition to the various LCD backlight. 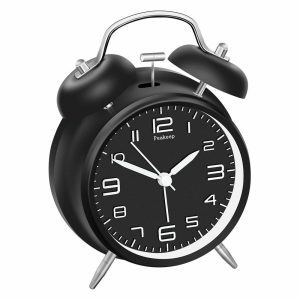 The designs make it a valuable item to keep over the alarm clock functionality it is intended to serve. It is easy to operate, small in size, and it can fit anywhere you choose in the kid's bedroom. 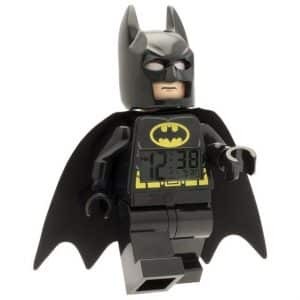 Those kids who play the LEGO construction and building game online or own those play set blocks will find the addition of LEGO Kids’ DC Super Heroes Mini Figure Alarm Clock to their bedroom a fantastic addition. The LEGO games involve many blocks, and if you think the alarm clock design just suggest a small piece, you are in for a rude shock. This clock is huge and is approximately 9.5 inches tall that you cannot squeeze anywhere in the existing bedroom arrangement. It is ideal to serve as a desktop or to be placed on the bedside table of the bedroom. It is designed similar to the doll figures in the LEGO construction game. It has a yellow backlit display that you access by just pressing on the batman's head. Even though the cape and the crusader’s mask add no value in the timekeeping task, it is meant to capture the realistic impersonation of Bruce Wayne. 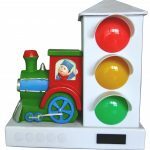 This is a fantastic and functional alarm clock for kids aged between 3 to 5 years. The clock comes in lovely designs and extraterrestrial character that children in that age love and can associate with. In addition to the LCD screen displaying time, it flashes fantastic animations that make kids happy and enhance their mood. It provides the guarantee that their morning will be a happy one as it is the first thing they set eyes on once they wake up. At night, the clock emits a yellowish glow that mimics the sunset. This prepares them for bed early in a relaxed manner. Forget the noisy alarms only. Besides, they will be greeted with a greenish glow. This clock is easy to program and the snooze function or nap timer by a click at the base. It comes in various faces to enable the kid to customize its looks from time to time. In the star wars franchise, Darth Vader is one of the iconic characters that he has received mixed feelings from the viewers because of the evil character he was portrayed to be. 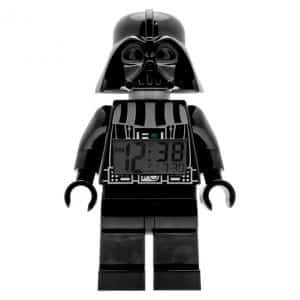 The design of LEGO Kids’ Star Wars Darth Vader Figure Light Up Alarm Clocks for kids is an irresistible collection that you will not mind adding to your collection. Similar to the Batman keeper, it has a height of about 9 inches and requires you to create enough room for it. It has an LCD backlight that glows in red that mimics Darth Vader light saber. The figurine details are on point right down the mask worn by many people in costume parties. Similar to the LEGO Batman design, the Darth Vader alarm is activated by just pushing down on the helmet. If thinking of getting a present for your kid who loves this series, this is the perfect gift.